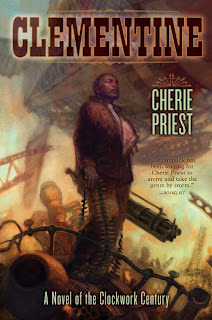 Cherie Priest's second long-form entry Clementine in The Clockwork Century world follows a side story from the Hugo nominated Boneshaker, which just happens to be one of my favorite reads from last year. Having read Boneshaker isn't necessary to enjoy Clementine, but it does add to some of the references made. The story flips between two perspectives which are both uniquely idiosyncratic and well developed in their own right. The stars are airship captain and escaped slave Croggon Hainey and former confederate spy and patriot Maria "Belle" Boyd. Both are something of a living legend or menace in this world depending on what side of the fence your are viewing from. Neither take crap from anyone. 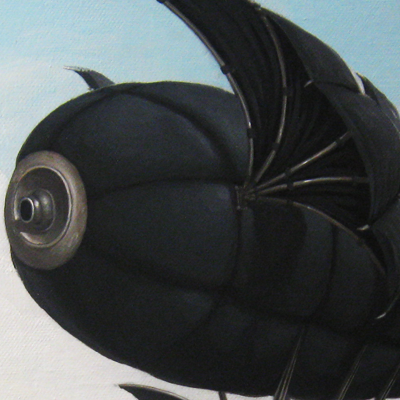 Croggin is chasing after his airship the Free Crow, which was nefariously stolen from him in Seattle. Belle is sent to ensure the Free Crow reaches its destination without Croggin's interference. Belle is actually based on a true person of the same name who acted as a spy for the Confederate army. Priest builds on her history to create a very determined and dangerous character very much true to life. Clementine's greatest strength is the dialog of the main characters. Each has their own style that colors the characters perfectly. Clementine is a much more subtle story than Boneshaker, but it is no less enthralling as every chapter moves at a brisk pace. 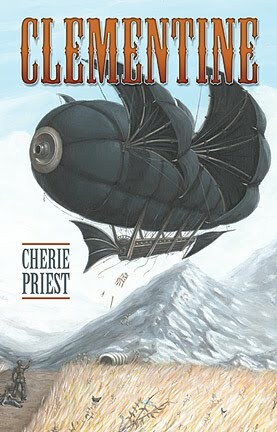 Airship fights, spies, thieves, and giant guns all make Clementine a seriously steam-powered wild ride through the sky, which showcases a larger part of Priest's Clockwork Century fractured North America. The war of the North versus the South is still on going in the late 19th century filled with steam-powered weaponry and mad scientist trying to turn the tide of the war one way or the other. I did feel Cherie had to rein herself in with the book to keep it to novella length as she clearly loves this world and its inhabitants. Hopefully, she'll treat us to more with Belle and Croggin. Belle definitely has an adventure left for here. I kept expecting more of a intimate relationship to develop between Croggin and Belle, but things do seem to have been left open somewhat in that regard. The story arc does complete itself rather well with a fitting culmination and a few surprises along the way. We also learn being a Mad Scientist doesn't necessarily mean they are a bad scientist. Priest is gives us glimpses of a world that is wide and wild in a story that hardly touches the ground. Clementine shows off the southern flair that Cherie has become famous for, but will please even hardened Steampunk fans with her ingenuity at keeping everything fresh and yet historically stylized. I give Clementine 8 out of 10 hats. Cherie still has a lot more in store for us in The Clockwork Century including at least two more shorts and the next full length novel Dreadnought, which Tor will be releasing this September. She is definitely earning the moniker as the Queen of Steampunk, but she may have to duel it out with Gail Carriger in some sort of no holds-barred battle royale. Oh, she's defiantly the queen. Blake already calls me the princess. I'm contemplating a She-ra style steampunk outfit as a result. I'd still like to see you two go at it. You in your prim and proper garb and Cherie in her leather get-ups.